There are many ways this happens. Below gives you a taste of the kind of help we receive which we are very grateful. Funding can come in a few different guises. Financially, of course is the main way, however we also receive materialistic funding in the form of donations people send us. Some people donate items for car boots and some donate items for us to take with us. Also by selling items from The Gambia and general ‘fun-raising’. We are also registered with easyfundraising.org.uk. It is a simple way of raising money through online purchasing. If you register with them, when you buy from a website such as Marks and Spencer or Amazon (there are 2700 retailers) the retailer will donate to The Indigo Project-Gambia. So you buy, and they donate. How we get our funding? 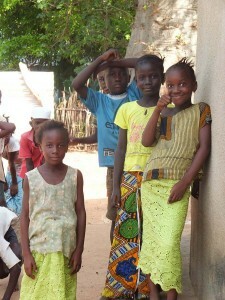 We were lucky to have received some funding from The Gambia Experience Holiday Company in 2012. The Gambia Experience is a sustainable tourism provider and a member of the Tourism Industry Carbon Offset Service. They promote Green Tourism and as well as offering holidays they have an active role in supporting the people of The Gambia through many projects that have the same ethos. The Gambia Experience offered The Indigo Project-Gambia £400 and two return flights to The Gambia to provide mosquito nets to the families and children the project supports. We are registered for RagBag/ Textile collections with Nathans waste savers, this on average raises £1000 a year. We are registered for Gift aid, so on average £800-£1000 a year from this method. We cater at A Whist drive in Nairn each month, this raises £500 a year. At the start of academic school year 19/20 The Indigo project – Gambia will sponsors just over 60 children, forty of which have an individual sponsorship from friends of the charity. All money raised by the charity first goes on ensuring fees are in place for the next academic year of the children without a sponsor before anything else. So individual sponsorship gives us financial stability which allows further fund raising efforts to target other areas such as health care, refurbishment projects and skill training. Each visit to the Gambia we identify children in need of support or headmasters approach us when a child’s circumstances have changed and they need support. Academic school year 19/20 we will be sponsoring a further ten children. We are currently looking at grants to build an Upper School at the Janet school, this will cost £5,000 and will allow children to complete their education there. We are also applying for funding to purchase the land that The Janet School is on, this will be £40,000.